It’s the mother of all parties! And you don’t have to just watch. 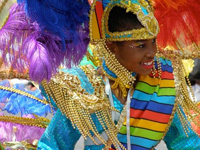 In fact, you’re encouraged to “wine” with the thousands who jam the streets of Port-of-Spain every February for Carnival in Trinidad, a celebration that blows the beads off Mardi Gras in New Orleans and rivals Carnaval in Rio. You can’t help but be swept up in the raucous atmosphere, with music as the catalyst, and thousands dressed up in colorful, albeit brief, costumes swaying in rhythm to the chest-thumping beat of soca music. When the partying begins, it’s nonstop until the day after Fat Tuesday when the country shuts down as if nothing happened, and revelers head to Tobago to really “wine” down after the four days of frenzied behavior. In case you’re wondering, “wining,” or to wine, means gyrating and jostling your body against one or two, or perhaps three others, as you march down the streets in the run up to “playing mas,” and the actual day of playing mas—when it’s all for real. Costumes are available for anyone who can afford one. Some can cost hundreds of dollars. Then you’re assigned to a “tribe” that wears identical costumes—such as Fancy Indian, Fancy Sailor, etc. The costumes are colorful and elaborate, but usually skimpy. They come complete with headbands, armbands, and hundreds of brightly colored beads. The day before the final parade on Fat Tuesday, there’s a “run-through” of the festivities where you’ll join other partygoers as they march through the streets or “chip,” a form of short-stepping, until you reach Queen’s Park Savannah, where lunch and drinks await—a welcome relief after dancing. Here’s the good news—you get to do it all over again the next day—and in full costume. If there’s one thing you’ve learned during this “practice,” it’s how to pace yourself in the hot Trinidad sun. Despite the heat and the lack of shade, you can’t help but join the hip-swivling, booty-shaking craziness—it's just the thing to do! You can have a taste of how wild and wooly it will be if you also take part in J’Ouvert, Creole for “daybreak.” This early morning ritual can trace its roots back to the days of the Caribbean slave trade in the early 19th century. Slaves would imitate the Carnival parties and costumes of their French owners by dressing in rags and covering their faces in ashes and mud. are a swash of color. J’Ouvert begins at 3 a.m. and you’re warned to wear clothes that you might possibly just throw away after all is said and done. Locals and visitors, paint-smeared and some looking like the devil incarnate, line up behind a truck crammed with oversized speakers that will shock the drowsiness from your tired body. On the first jarring note, it’s off down the streets, meeting passersby who join in or throw paint, mud, or anything else that will stick to the skin. Before the sun is up, everyone is covered in colors and dancing wildly to the pounding drums emanating from the truck that snakes its way through the streets, shattering any thoughts of sleep. 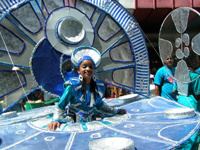 This song, and others like it, are also part of the Trinidad Carnival tradition. They compete to become judged the most popular song for that particular year. In the nights before finally playing mas, local performers entertain a packed stadium with their music, hoping to be named the top artist with the best song. Another popular contest is Panorama, a musical fight among groups who play the steel pan. The steel drum originated in Trinidad and the distinctive sound can be heard around various “pan yards” before the final competition that includes up to hundreds of pans being played by rows of musicians. Other competitions are also staged during the four-day event. The main costume contest is the Kings and Queens competition, and the entries are magnificent in both size and style. The competition takes place in the evening, but there is a junior version of the event that occurs during the Children’s Parade in the morning. The costumes’ themes are amazing, from spiders to dragons to butterflies and mythical sea creatures. J'Ouvert revelers are spattered with paint in this pre-dawn festivity. But every activity is a build-up to the grand finale, the Band of the Year contest — the highlight on Fat Tuesday. The “bands” are the organized groups of costumed tribes who represent the theme with their costumes. You can see Indians, bats, birds, sailors and the like, shaking and chipping their way toward the stage and the judges’ stand. Once there, they have just a few minutes to demonstrate to the panel how much spirit and power they can muster before being ushered off so another can try to win the judges’ votes. It’s all over in a few hours, and nothing remains except the litter and an occasional armband or feather that's slipped from a costume. Visitors go home the next day, while Trinidadians head en masse to Tobago, where they can really wind down. Copyright ©2018 - 2020 | ROAD & TRAVEL Magazine | All rights reserved.